Come explore the vacation paradise of the Bahamas Exumas and Out Islands! 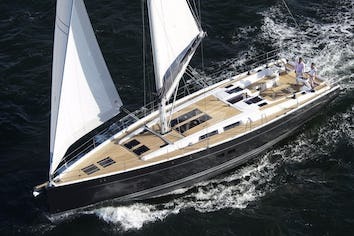 The luxury sailing yacht Rubicon offers the perfect way to enjoy your Bahamas vacation. 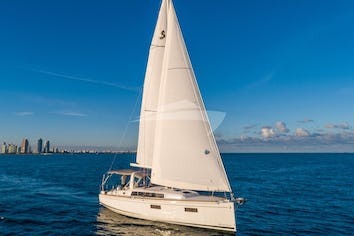 This spacious 44’ catamaran offers the best of everything that makes a yacht charter vacation great: beautiful, comfortable accommodations, an expert and enjoyable crew, fabulous food, and so many fun things to see and experience. Rubicon’s interior decor is casual elegance with shiny wood paneling. Photographs shot from the owner’s family world cruise enhance the staterooms, creating a wanderlust feeling to sail to remote regions of the globe. There are many enjoyable places on board to enjoy! The main salon, cockpit, and forward trampolines are the main gathering areas for meals and activities. The trampoline area is the optimum spot to hang out while underway, enjoying the salt breeze and luscious scenery of the islands. 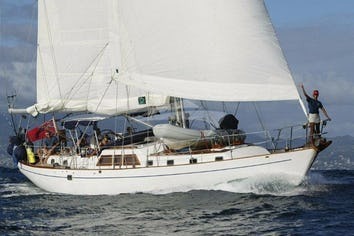 Cat Rubicon carries a crew of professional captain and chef. It is the perfect yacht for a group or family vacation. Among her many possible activities are kiteboarding and surfing. You may also participate in eco adventures including feeding swimming pigs, snorkeling, kayaking, hiking nature trails, sailing and enjoying remote beaches. Please note, the video shows the beautiful Bahamas scenery above and below water as seen from Rubicon, as well as lots of great kite-surfing. Families enjoy a discount of $250 for one child under 6 years of age on a week-long charter. Accommodations for up to 5 guests in three private cabins described below. Each stateroom is equipped with ensuite bath, electric fans in each cabin and AC in two forward cabins. CABIN 2: Starboard side forward, featuring a queen-sized berth, large opening hatch overhead, 2 large closets and 2 beside shelves. (Cabins 1 & 2 are equivalent in the layout.) A private bath and shower/small tub adjoin. RUBICON has a new Honda 2000 watt generator that runs the A/C all night at anchor! However, it really only sufficiently cools the two fwd cabins OR the salon, so we can only offer A/C for two cabins. RUBICON also has a 2kw inverter. If you wish to "go green" and help the environment you are welcome to turn off the A/C and experience the breezes from the tradewinds as with open hatches and electric fans they are usually quite sufficient to keep you cool. Charter guests aboard Rubicon can look forward to Vrin’s excellent and innovative cuisine. Her energy and attitude are perfectly consistent with her motto: “Wealth is the ability to fully experience life.” Charter Rubicon with Chef Vrin and Captain Adam for an unforgettable life experience. We enjoyed every minute right down to sleeping under the stars on the trampoline. The whole trip was very relaxing. The yacht was clean and well maintained. There was plenty of room since we were just two passengers. We used the paddle boards and the snorkeling gear. The diving was amazing. The chef did a wonderful job with the meals and was very keen to our eating habits. Adam was terrific. Very accommodating and friendly. Quite knowledgeable about the area and secluded spots to go. Jen was awesome. Gifted at creating unique food combinations using common ingredients. Crew was 5 Star! Itinerary: A great combination of remote, secluded spots and a couple of stops in 'civilization'. Sports & Leisure: Kayak and paddle boards were excellent. Snorkel and spearfish gear fine as well.Loved being able to troll for fish off the stern while under sail (caught four fish, one was delicious!). Food & Drinks: Adam makes a great gombay smash. Jen's appetizers were fantastic. 5-11 August,2017 – Life Changing! Guestbook entry: Many thanks to Adam and Tina for a fabulous week in paradise!! The food was extraordinary as was the snorkeling, sailing, adventures, and the weather! We loved hearing their stories of sailing the world and getting to know their whole wonderful family! Their adventures may leave a small footprint behind, but they left a large footprint on our hearts! Happy sailing! July 15 – 19, 2016- Bahamas – Amazing & Wonderful! April 10 - 18, 2016 - Best Ever! You were a very intuitive host, we all got to do what we all wanted each day of our trip, be it swim, kayak, flyfish, jog and snorkel. Not to mention, eat gluten free and plenty of fish! Capt. Adam & Sarah were engaging & interesting. Adam’s life experience aboard boats was impressive. Everything on the boat worked perfectly. Though we arrived with no particular agenda, we appreciated the suggestions of Capt. Adam. We hadn’t taken much time to research the endless possibilities of destinations in the Exumas and Out Islands. We were lucky to come upon Rubicon. The opportunity really feel the islands seemed personal and passionate to Capt. Adam. His knowledge and kindness was especially appreciated. Sarah’s good sense of humor was grand in all ways too! Overall, such a fantastic week! Thanks for the fun times! We had never been to the Bahamas before, so we were astounded at the abundant sealife and beauty of the Exumas. The remote anchorages were calm and scenic, and nature walks ashore introduced us to the incredible bird life. Our favorite adventure was taking the dinghy ride through the mangrove creeks. I never knew there could be so many turtles up there. The clarity of the water was just amazing.The best part was feeling the enthusiasm and love that Captain Adam had for the Exumas. We loved hearing island stories over Sarah’s fantastic meals in the cockpit at night. Everything was wonderful, clean and more than we expected. Thanks for sharing your world with us! We went into the trip a little hesitant to stay on a boat for that long of a time. I will tell you it was an enjoyable experience. The sailing, food, conversation were all wonderful. Adam and Sarah do their best to let you enjoy the views God provides. One of the best parts was spear fishing in the morning and then having dinner that night. You talk about fresh fish. My first statement is blown out of the water (no pun intended) with our trip. When you said we might be able to swim with dolphins, turtles, sharks and rays, I wasn’t sure you could pull it off. But whoa! Watch out what you ask for! Good thing I have the photos you took with your underwater camera to show jy family and friends back home. They didn’t believe me until I pulled out the one with the big turtle. What a wild day that was! The snorkeling was our favorite part of the trip, next to Sarah’s excellent meals. The reefs were colorful, fish were in good numbers and the anchorages pristine. When they say Bahamians are some of the friendliest people in the world, it’s true! We really liked the bar and food at Staniel and Chat n’ Chill. The crew on Rubicon were engaging & interesting. Adam's life experience aboard boats was impressive. Everything on the boat worked perfectly. Though we arrived with no particular agenda, we appreciated the suggestions of Capt. Adam. We hadn't taken much time to research the endless possibilities of destinations in the Exumas and Out Islands. We were lucky to come upon Rubicon. The opportunity really feel the islands seemed personal and passionate to Capt. Adam. His knowledge and kindness was especially appreciated. The crew's good sense of humor was grand in all ways too! Overall, such a fantastic week! Thanks for the fun times! My wife petting a shark. Thought I'd never see the day for that to happen! So, thanks for all the wild and fun adventures aboard Rubicon. Capt. 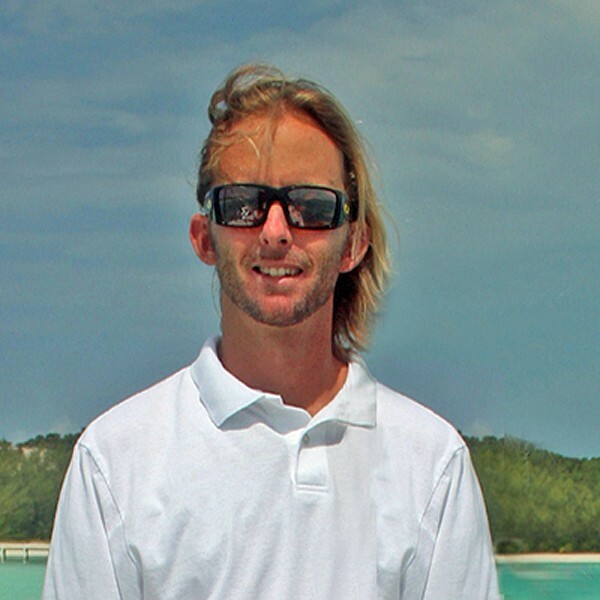 Adam's knowledge of the Exumas made our charter week very special. His enthusiasm was evident. We liked his flexibility and sweet disposition. The crew kept us laughing at our hesitation to get out there and really play with sharks, stingrays. We're pasting the photo in our office cubicle at work. Just to remind us where we want to go next year. Take us to another Out Island! We want to see more of the Bahamas!